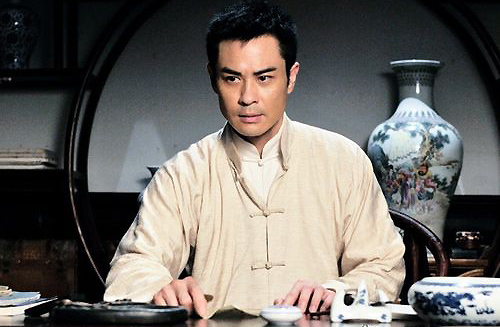 Filming mainland TV drama, Ip Man <葉問>, since August, Kevin Cheng (鄭嘉穎) has been vigorously training in Wing Chun. With 25 percent of the scenes requiring martial arts, Kevin needed to continue practicing Wing Chun and study his script during filming breaks. “Out of the 800 scenes, there are 200 fighting scenes,” Kevin revealed. Kevin also pointed out that the audience was smart and realized that there will be differences between a film and TV production. However, the TV drama format allowed the Ip Man story to be told in greater detail. “Audiences can follow Ip Man from a young boy to his middle age, growing with his character,” Kevin said. With the action choreography standards of the Ip Man TV drama set exceedingly high, Kevin revealed that one action sequence may film for one entire week. Although he claimed that this was the most strenuous role he has taken on, Kevin reportedly pocketed $7 million RMB to play Ip Man. Approximately one-fourth of the drama has already been filmed, with a scheduled December broadcast date. Kevin’s main romantic arc with be with mainland actress, Cecilia Han (韩雪), who portrays his wife, Cheung Wing Sing. Their characters were married as children, in which they met each other once again in adulthood. Appearing before Cheung Wing Sing as a simple country boy, Ip Man left a lasting impression with her. The pair’s love relationship was met by obstacles, but they will see it to fruition. Cecilia even put aside her introverted personality and treated the cast and crew to snacks. Kevin said, “It’s normal to have good communications during filming. I often buy treats for the crew too!” Cecilia and Kevin got along well on the set of Ip Man. Kevin has also been busy making arrangements for his first drama to be released under his own production studio next year. Kevin already has scriptwriters drafting the script, which will feature several short stories in the drama. He revealed that he will invite some of his good friends to star in the drama. WTF? when did this happen?? A whole ago, but who knows if this will actually happen. Nick Cheung and Louis Koo always said they would come back to film TVB But they never did- well not yet anyways. Even if Andy never comes back to film a series, TVB is still going to benefit from his mentioning that he is considering to come back. That’s the whole point of the PR at TVB right now. Too many competition from other networks, they have to try anything they can to keep viewers. Let’s stop giving action roles to people who aren’t fit enough to do them. And let’s stop giving movie roles to girls with the biggest *. I disagree, let’s not give roles to girls with big planets, I don’t want to see stitches, or imbalance planets. I know, Kevin is being coy. He probably thanked the producer later w/ a wink. Whoa, isn’t that cutting it close? I hope Kevin invites charmaine to star in one of his short stories, hopefully a romantic one. Last time, KC seemed to enjoy the relationship with LF a lot :D. They play pat pat game, and lolz. But, no pic of KC and Chrissie? Maybe they should show just how “passionate” the kiss is, or, is it yet to come? Kevin should be quite adept at it by now. Chrissie chau? This series is gonna be a flop. Not to mention i wont be convinced by kevin’s martial art moves considering he cnt even pull off the boxing skills in gloves come off. Did he gain weight? He looks good in the picture. Doesn’t matter, but agree with you over his looks his looks. Doesn’t he?